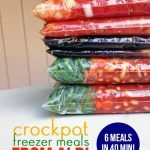 Last weekend, I made six freezer meals in 40 minutes (including clean-up!). 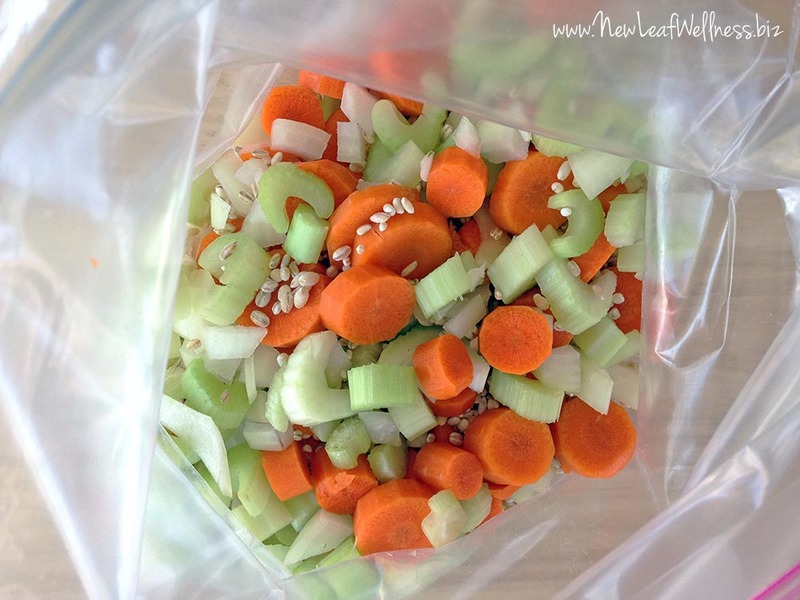 I picked three of our favorite crockpot recipes and froze them in gallon-sized plastic bags. 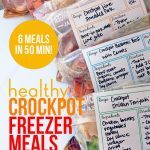 Not only were they incredibly easy to make, but now my freezer is stocked with healthy meals that my whole family will love. These recipes are proof that “comfort foods” can be healthy too! All three recipes feature boneless beef chuck shoulder roasts. It’s my absolute favorite meat to cook in the crockpot because it cooks down and melts in your mouth. Comfort food at its finest! Boneless beef chuck roasts were $1 off per pound at the grocery store last week, so I was able to save $10 on the meat needed for these recipes. Yay! An absolutely amazing taste that is warm and comforting! Bonus points awarded because they make my house smell like I’ve been slaving away in the kitchen all day. I spent $50 on ingredients and froze all of my meals raw. If you’re nervous about mixing raw meat and vegetables, check out this info from the USDA Food Safety and Inspection Service. 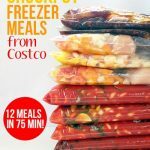 I did a lot of research when I was writing my No Cook Freezer Meals cookbook and learned that freezing to 0 °F inactivates any microbes present in food (such as bacteria, yeasts, and molds). That means freezing raw meat with vegetables, sauces, and spices is perfectly safe. I do all of my shopping ahead of time. Lastly, remove as much air as possible, seal, and stack in the freezer. 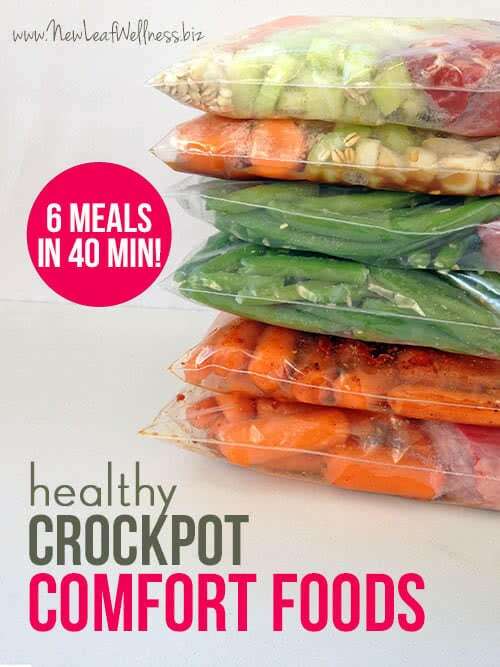 Wont the veggies turn to mush if you throw it all in the crockpot at the same time? Or are you starting the meat first? I am not sure how you do your sauces as well. My hubby and i drive truck and a crocpot meal is easy for us. When i am home i can buy and fix these and theow them in our freezer in the truck. Then take and put in crockpot when ready. Any help on understanding would be awesome. Hi Patti! I put everything in the crockpot at once. So easy! If you click on the pdf above, you will find my grocery list and recipes. The recipes should explain everything step-by-step. If you have any other questions, let me know. 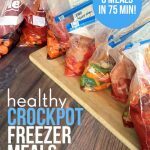 I’m new to freezer cooking and want to know why we need to thaw before cooking? I’ve only done 1 set of meals so far which listed thawing as well before cooking, yet I tried 1 meal without thawing first and the only difference I noticed was it took an hour longer. Can you explain the reason for thawing? Thank you. 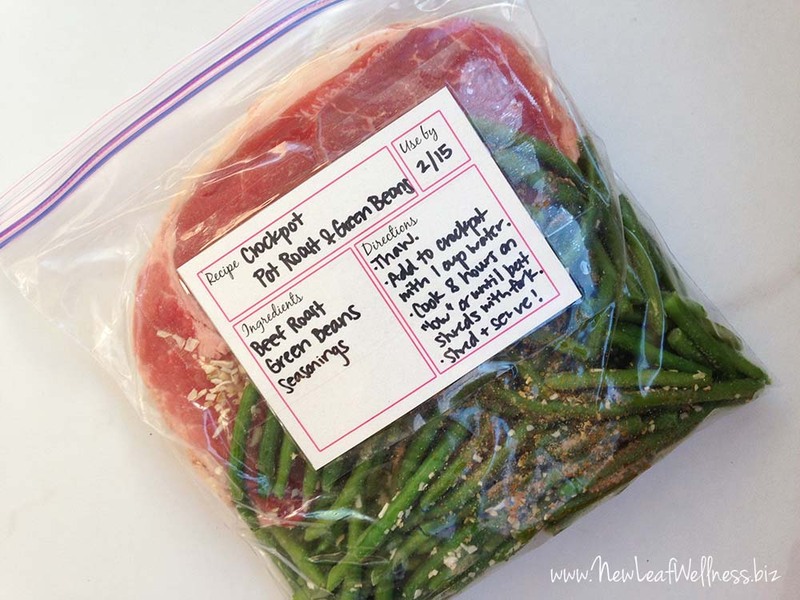 From what I’ve read, it’s safer for meat to cook when it’s thawed. If frozen, it could take too long to reach a safe temperature and potentially grow bacteria. 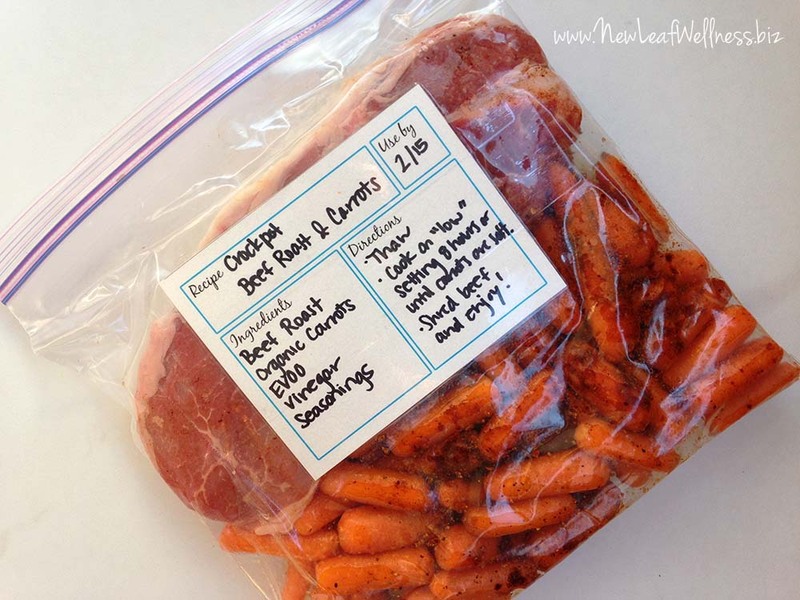 If you’re using a pre-cooked meat, like meatballs or ham, I think it should be OK to add them frozen. Hi! Any ideas on what could be subbed for the barley (we’re gluten free). Thanks so much! I would use 1-2 potatoes. 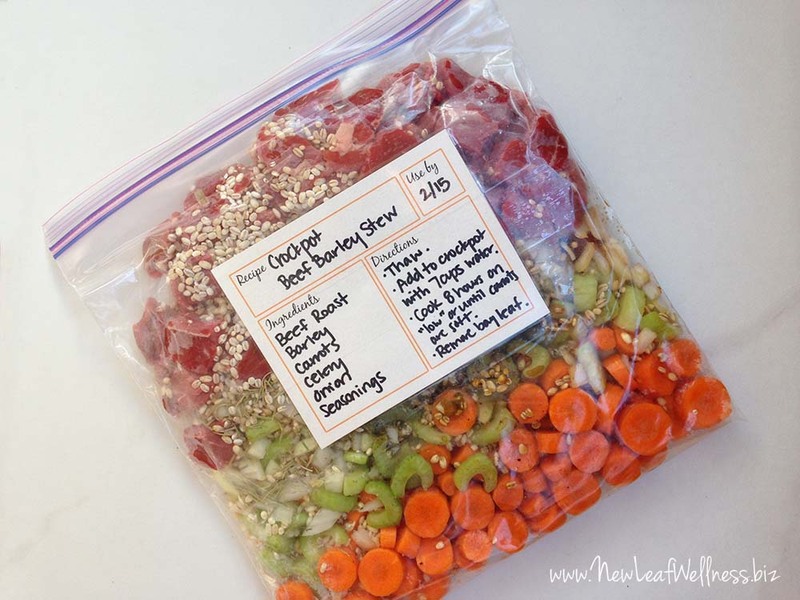 Peel and chop them right before you’re ready to seal the bag so they don’t sit out in the air too long. I also tend to add my freezer meals with potatoes to my crockpot frozen (or at least a little more frozen than thawed). I think that helps keep the potatoes from turning brown.